My husband's not big on camping. In fact, I don't think he's ever gone in his entire life and he's not about to be talked into it this late in the game. My poor children had never had a camping experience until we visited my sister's family while they were camping. 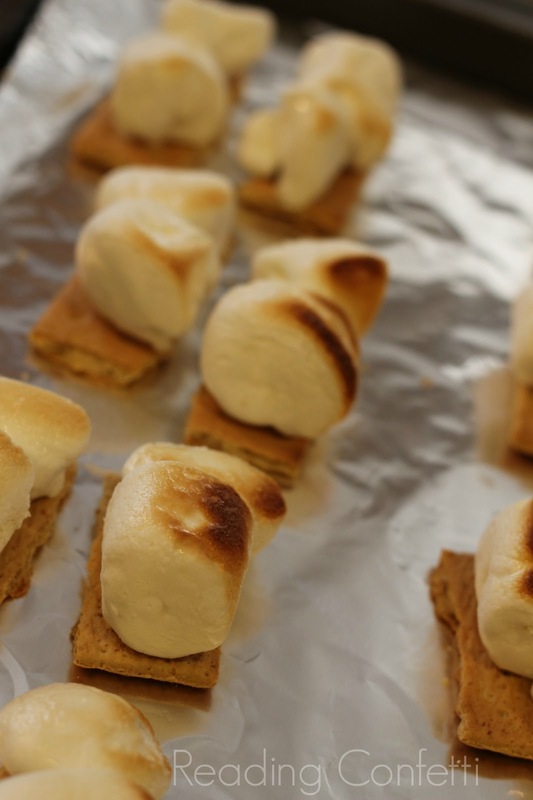 Of course, they loved it and one of their favorite parts was the s'mores. He may not like camping, but my husband has a sweet tooth and he came up with the idea of making frozen s'mores at home. (The man will stop at nothing to get out of sleeping in a tent.) 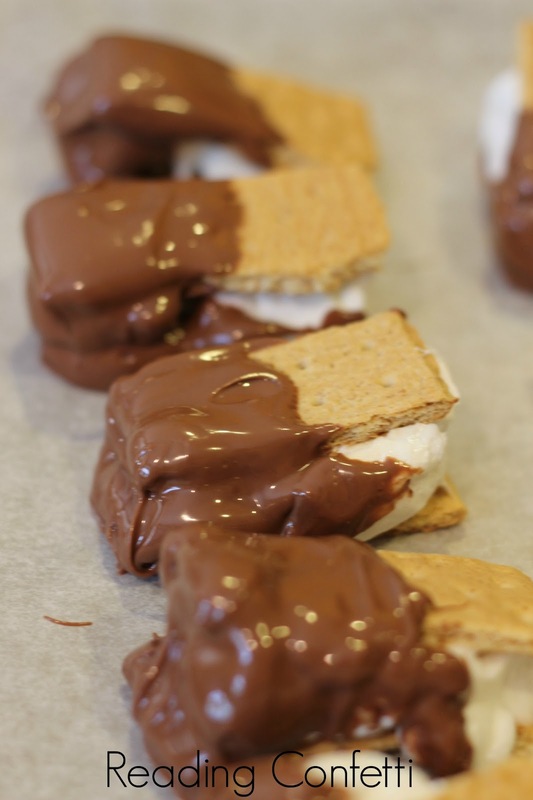 It was a great idea - these s'mores are made using the broiler so you can make them any time of year, but because they're frozen, they make an especially good treat for a hot summer day. 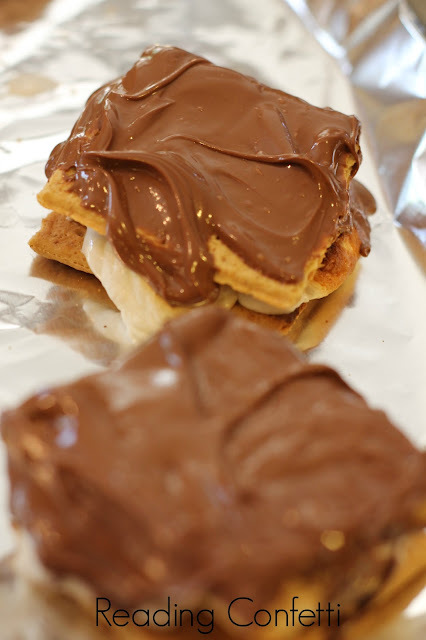 I used 8 graham crackers, about 1/3 of a bag of marshmallows, and 3/4 of a bag of milk chocolate chips. I'm sorry I don't have exact measurements for you. I was winging it. I laid out four of the graham crackers, broken into different sized pieces. I also lined the baking sheet with aluminum foil to make clean up easier. 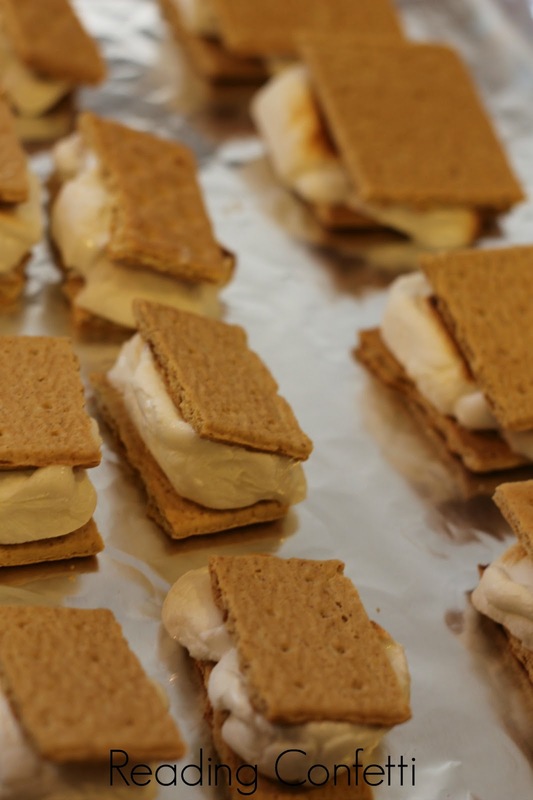 We like lots of marshmallows, so we cut some of them in half to be sure the graham crackers were entirely covered when we topped them. I put them under the broiler and kept a very close eye on them. Once they were golden brown, I took them out and immediately topped them with another graham cracker. After taking a picture, of course. Next, I melted the chocolate in the microwave in 20 second intervals. I dipped the smaller s'mores into the chocolate and put them on a parchment lined baking sheet. For the bigger ones, I drizzled the chocolate over the top. We froze them for about a half hour before we ate them. When We Go Camping by Margriet Ruurs - In this beautifully illustrated book, one busy family finds lots to do from sun up to sunset. At the campsite, there’s wood to chop for the fire and fish to catch. And there’s lots of time to explore, climb rocks, splash in the lake, and discover animals in the shadows of the woods. As afternoon turns to evening, supper needs to be made, and just before bed, stories are told around the campfire. 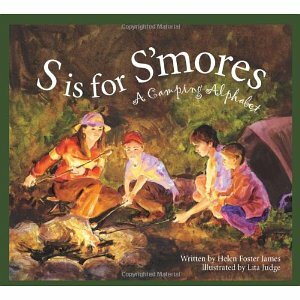 S is for S'mores: A Camping Alphabet by Helen Foster James - Next to baseball and fireworks on the Fourth of July, nothing else seems as American as the family camping trip. 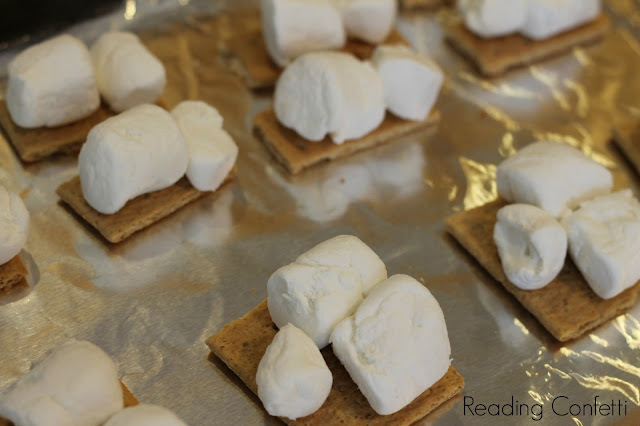 From what to pack, where to go, and what to do when you get there, S is for Smores: A Camping Alphabet takes readers on an A-Z trail exploring this outdoor pastime. A Camping Spree with Mr. Magee by Chris Van Dusen - Mr. Magee and his trusty dog, Dee, are enjoying a peaceful camping trip when all of a sudden they find themselves plunging down a mountain and teetering on the edge of a huge waterfall! How will they find their way out of this slippery situation? Does your family like camping? What's your favorite part? Camping...ugh! I am right there with your husband. We have done some indoor "camping" but I tend to end up in my own bed sometime during the night. These s'mores look A.M.A.Z.I.N.G! Thanks for sharing!! You guys can come camping with us and leave him at home anytime you want! These look awesome!!!! 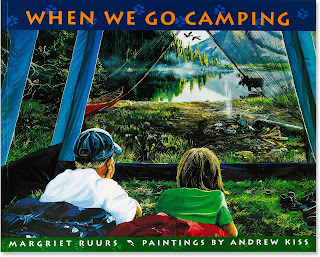 And When We Go Camping is our favorite camping book too! 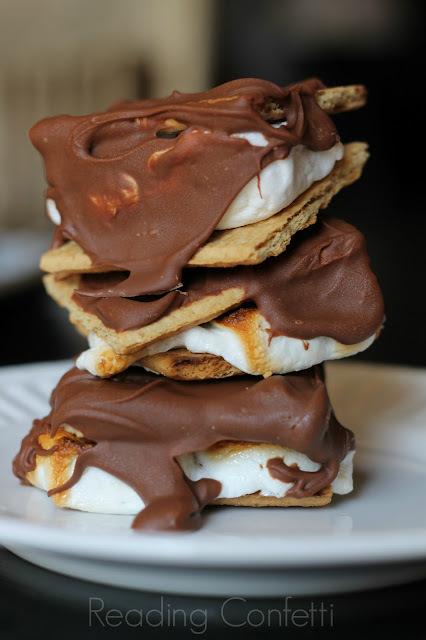 I need to find S is for S'mores! We went camping once...in a cabin with a tv, shower and A/C! But it was a campground. That counts right? That's TOTALLY camping and the only kind we'll probably ever do with my husband! 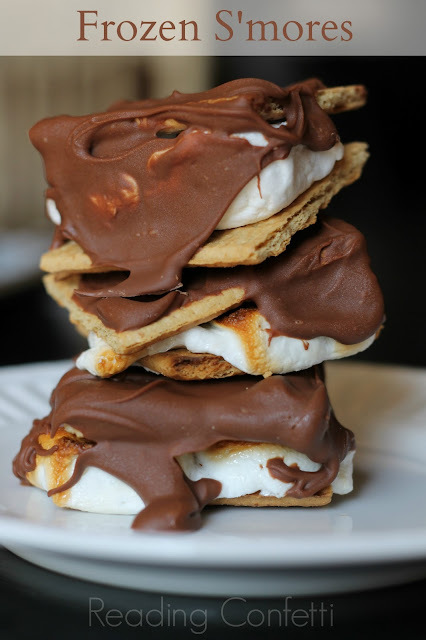 The s'mores look delicious!! Pinned it! Thanks for sharing at TGIF! Ooooh! 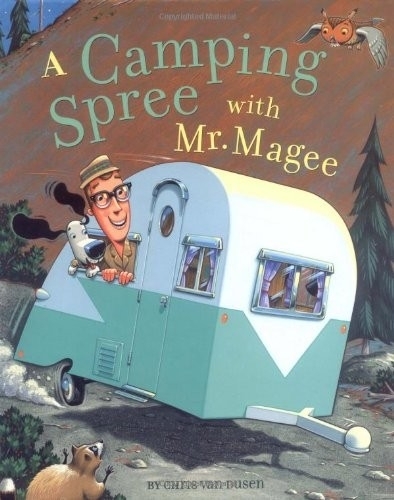 I love the camping books you paired with this. You waited 30 minutes for your s'mores? Who has that kind of patience? They do look good though. 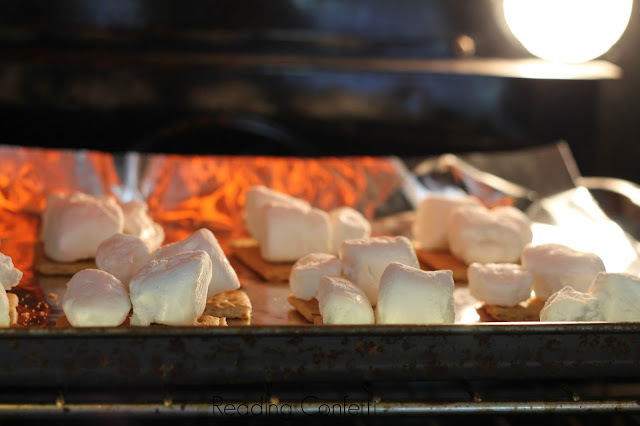 S'mores in the oven, I love it for when you can't get to a campfire! I'll be featuring you this week on Mom's Library at Crystal's Tiny Treasures. If I am saving these to eat the next day- should they be kept in the freezer? Yes, keep them in the freezer. They'll keep for a while.